Citrix is advancing its IT-as-a-Service vision by allowing service providers to deliver hosted desktops and applications as well as hosted exchange-as-a-service in addition to the broad array of cloud services in CloudPortal Business Manager 2.2. What’s new in CloudPortal Business Manager 2.2? 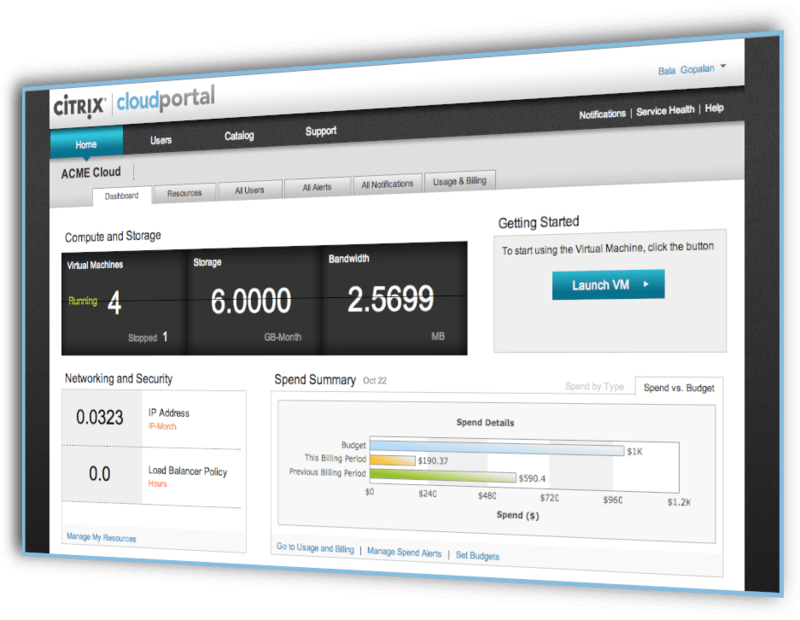 CloudPortal Business Manager 2.2 adds several new features and enhancements since the previous 2.1 release. A single pane-of-glass to provision and access hosted applications, desktops and hosted Microsoft Exchange, delivered by CloudPortal Services Manager in addition to a broad array of cloud services currently delivered by CloudPortal Business Manager. A unified billing solution for services delivered by CloudPortal Business Manager and CloudPortal Services Manager. Volume resizing support: This CloudPlatform feature allows users to change Data Volume size to a different disk offering after it has been created. Usability enhancements: This release includes several usability enhancements such as support for VM search, enhancements on network and VPC creation/management and usability enhancements to subscription workflow. Feature Enhancements – CloudPortal Business Manager 2.2 includes several new features and enhancements such as support for quantity based billing, ability to set up CloudPortal Business Manager in Intranet-only mode, support for per user service enablement, among others. Upgrade path – A simple upgrade process allows customers to move from a previous version of CloudPortal directly to CloudPortal Business Manager 2.2 without any intermediary steps: CloudPortal 1.4.3 – 1.4.7 to CloudPortal 2.2 and CloudPortal 2.1.0-2.1.1 to 2.2. In addition Citrix CloudPlatform Business Manager will continue to support these key features. Cloud Services Catalog – Create a custom catalog of services including IaaS, cloud, 3rd party, value-add and IT services that are delivered to users through a simple, self-service catalog. Customization SDK– Customization SDK allows development teams to customize the user experience look and feel by allowing them to tailor the following user interface components for their organization: workflows, e-mail templates, reports, user interfaces, custom jobs, validation rules, custom fields, resource properties, hooks into pricing filters, billing data export, payment gateway and ticketing connectors. BSS/OSS APIs – BSS/OSS APIs focus on application and service integration to allow connection to internal and external business and operations support systems such as CRM, financials, etc. and to inject custom business rules and workflow requirements. Citrix and Partner Connectors – CloudPortal Business Manager 2.2 makes it easier for IT to transform into a service broker with 3rd party connectors from partners such as Appcara, ActiveState, Caringo, Cloudian, Cloudsoft, CumuLogic and others. CloudPortal Business Manager 2.2 also includes reference connectors for ACS 4.2 and OpenStack, as well as deeper integration with Citrix products using the connectors to Citrix CloudPlatform and CloudPortal Services Manager. CloudPortal Business Manager is an integrated cloud services delivery and business management platform that unifies and simplifies the delivery, operational, commerce and user management aspects of a cloud. Organizations can aggregate infrastructure, cloud, IT and value-add services and deliver them to users through a simple, self-service catalog of cloud services. Users can shop for cloud services, provision and manage the services in a self-service manner. Beyond service delivery, CloudPortal Business Manager centralizes the user management, provisioning and operational aspects of running a cloud into a single, comprehensive cloud business platform. CloudPortal Business Manager includes powerful tools to automate provisioning and orchestration workflows along with customer service functions such as onboarding, billing and metering to more efficiently run your cloud. The extensible architecture makes it easy to deliver a broad array of cloud services, while integrating with existing business, operations and IT systems such as help desks, ticketing, payment gateways, CRM and billing systems. Custom business rules and workflow requirements can easily be injected for service interactions such as account activation and provisioning requests to ensure business processes and technical requirements are met.